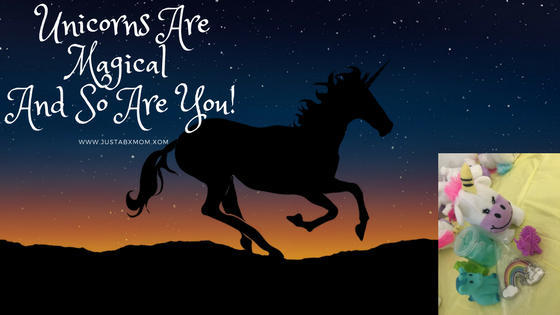 Unicorns Are Magical And So Are You! Unicorns are all the rage this year. Well, if I’m honest they always have been the rage. I remember going to the circus the year they billed having a live unicorn. Yup, look it up and once again see how old I am! Either way their popularity has been seemingly growing and so far this year JustaBXgirl and I have attended two unicorn themed parties, viewed a heap of them on social media and am now planning a Princess, Unicorn, Knight & Dragon themed party for her 5th birthday in January! I’ll let you in on a secret. Unicorns are so popular because they are magical. Know what else? So are you! And since we are all magical we love magical things. And it doesn’t help that they are just so cute. I dare you to find someone that doesn’t fall under the spell of a unicorn. This past weekend while heading down to North Carolina to celebrate my goddaughter’s birthday I was put in charge of her unicorn gift bags. Thanks to being an Oriental Trading Brand Ambassador I did not disappoint. I’ve been shopping at Oriental Trading for YEARS and I’m betting you have too. They’re my go to for all things party and crafting. As it was a first birthday party we didn’t do crafts and it was really hot so we actually spent most of the time in the pool. But, when it came to gift bags JustaBXgirl and her godbrother spent HOURS playing with their loot as I’m sure the other littles did when they got home from the party. As an Oriental Trading Brand Ambassador I receive free product to showcase on my site. As always all opinions are honest and solely those of JustaBXgirl and me. In case you want to throw your own unicorn party (and so I don’t have to search for it when it comes time to order for Justabxgirl’s birthday) I’ll share Oriental Trading’s Unicorn page with you here! I love how they organize things in one place so you don’t have to spend too much time searching even though you should always search on the site too because you never know what hidden gems you will find. Unicorn Characters – Forget rubber duckies these unicorns came in an assortment of colors and will make excellent bath toys. The colors were great for a one year old party and went really well with the tissue papers we used. Unicorn Rainbow Necklaces – These were a hit with the adults and the littles! Good thing we have extras so everyone was happy. Plush Unicorns – These were the centerpiece of our gift bags and I think my best friend’s favorite! They were the perfect size for the birthday girl’s hands and were very soft. Unicorn Porcupine Characters – These were lots of fun and the birthday girl’s favorite. They are really fun to pull on. I think they might have been my favorite as well. Pullback Unicorns – JustaBXgirl and her godbrother had more races with these than I could count. Outside of the putty these might have been the four year olds faovirtes. Unicorn Filled Rainbow Putty – So you know how I’m completely bad with DIY projects? My best friend and I had the wild idea that we would be able to make out own unicorn slime. Thank you Oriental Trading for putting me out of my misery and having these ready made! We nicknamed them Unicorn Boogers and they provided JustaBXgirl and her godbrother HOURS of fun. They even chose playing with their Unicorn boogers over their iPads!!! Rather than using traditional gift bags (and because we forgot to pick some up) we wrapped all of the gift bag goodies in two sheets of tissue paper. While it was a last minute save it ended up being really pretty and added to the magical feel of the party. I think I will consider using tissue paper over traditional bags for other parties. Now I need a name for them as cool as Unicorn boogers. We had more treats than children attending the party so we used the extra goodies as decorations. We held the party poolside so we hadn’t planned to decorate much but I loved how the extra treats made the tables look more like birthday party than just day at the pool. The day felt simply magical and I am so extremely grateful that I was able to be a part of it. Sometimes we don’t realize what we’re missing until we get it and I can definitely say the magic my goddaughter brings to the world was missing without her. Cannot wait to celebrate many more magical moments with her. Almost a week later and they are both still playing with the toys from the gift bag!! I love unicorns too almost got a tat of one at 18 still might but Def smaller,lol So many cute options love the unicorn duckies.